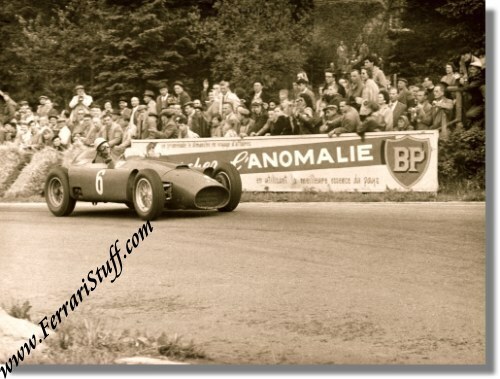 << Back Vintage 1956 Photo of Paul Frere on Ferrari D50 at the Grand Prix Belgium 1956 Race Winner! Vintage 1956 Photo of Paul Frere on Ferrari D50 at the Grand Prix Belgium 1956 Race Winner! Vintage 1956 Photo - Paul Frere on Ferrari D50 - Grand Prix Belgium 1956 - Race Winner!. This is a vintage & original photo, by famous motorsports photographer Jesse Alexander, of Paul Frere en route to victory in his Lancia Ferrari D50 during the 1956 Belgian Grand Prix at Spa - Francorchamps race track. The photo measures some 9.5 x 7.5 inches (24 x 19 cm) and is black & white. The back shows the stamp of Jesse L. Alexander along with some annotations.